Physicians and nurses in the United States aren’t the only ones being awarded continuing medical education credit hours to sell them on a sponsor’s products or political interests. A DRUG giant spent more than $514,000 on a weekend seminar at Crown that included just six hours of "education content". The symposium by Australian-based AstraZeneca included gourmet meals, alcohol and two nights free accommodation at Crown. Australian Medical Association president Rosanna Capolingua said the events were necessary and spending was reasonable. Currently, continuing medical education activities are, for the most part, sponsored by the pharmaceutical industry, which has a vested interest in promoting its products. This is big business: of the $2.6 billion spent in the United States on accredited continuing medical education activities in 2006, $1.45 billion (60%) came from pharmaceutical and medical device manufacturers. Although there are no reliable data in Canada, there is also no evidence that the situation is any different here. [T]he evidence suggests that education sponsored by the pharmaceutical industry frequently distorts the topic selection, embellishes the positive elements of studies3 and downplays the adverse effects. In effect, the industry focuses primarily on treatments and treatment-related issues at the expense of the larger therapeutic picture... We seem to have conveniently forgotten that the pharmaceutical industry is in business to make money, not to educate health professionals. That $27 billion goes for a lot more than pens. 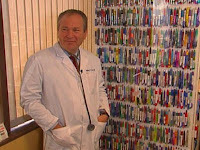 Still, Dr. Jeffrey Caren, a cardiologist at Cedars-Sinai Medical Center in Los Angeles, has collected more than 1,000 pens given to him by pharmaceutical sales representatives who’ve tried to sell him their drugs. As a followup story to “Are you being detailed?” at JFS, ABC News this weekend looked at the detailed profiling of doctors and their patients done by pharmaceutical companies attempting to influence their prescription decisions. Do Free Gifts Dictate Your Medical Care? …Dr. Jeffrey Caren… said his pillar of pens illustrates an institutional practice in which drug reps make the case for expensive, newer products that haven't been broadly tested, potentially risking patient health… Doling out pens, coffee cups, clocks and free drug samples, drug companies spend about $7 billion a year to convince doctors to prescribe their medicines. The pharmaceutical industry says its sales reps arrive well-informed and with good intentions, but many doctors say the practice is dangerous and needs to stop. At a recent on Capitol Hill, a former Eli Lilly sales rep, Shahram Ahari, gave lawmakers an insider's glimpse into the world of pharmaceutical sales… "The fact of the matter is, we don't just give a doctor a pen," Ahari said. "We give them bucket loads of pens, pads, we take them out to fancy dinners, we give them samples, we give them medical equipment. Everything we do generates this sense to return the favor. And what better way to return the favor to your drug rep than to prescribe their medications?"